Why no excitement for Virtual Reality? the 3d and virtual technology is moving so fast, I was involved in second life for 7 years and almost feel like it was a total waste of time and money. project sansar is interesting but something will come along to make it obsolete soon enough. Have you tried the Rift or Vive? Well, now it seems the Xbox One is getting an upgrade (One Point Five?). It should be at least 4 times as powerful as the current Xbox One. That massive boost in power should nudge it just into the range where it will be able to power the Oculus Rift though it remains to be seen what type of assets (textures, geometry, effects) we see. I still don't like VR really much. I have to press buttons in order to walk, I don't feel anything other than sight, and it feels weird. I wouldn't like if you could feel tactile stimulations by VR, you could feel pain, and I already know there has been an ethical debate about that. I don't like the idea very much. I still vastly prefer traditional gaming/whatelse. Go try the HTC Vive. Room scale VR-you dont have to press buttons to walk. You get some tactile due to vibration of the wands. Some gamestops may still be giving demos. Its seriously amazing. To the point of the OP, VR in my view doesn't have compelling use cases yet. It's early days, and expecting someone to strap a breadbox to their face, be tethered to a high-end PC and stagger around their living room interacting with virtual aliens, doesn't suggest to me anything like wide adoption. VR entertainment may well be TOO realistic and immersive for constant use by many. Some people have vertigo issues with 3D TV and I can imagine similar issues with VR if there's any kind of processing or network delay at all. I think it's also telling that FB and Google are running their own high-capacity network cable between Virginia and Spain in an attempt to get ahead of demand. Any sort of participative VR such as livestreaming events will require far more bandwidth (and far more bi-directional equivalent speeds) than are now typical -- just to enable the limited VR we have now. Microsoft's HoloLens is a little better ... an un-tethered augmented reality rather than virtual reality environment. This suggests much broader applications and wider adoptions to me, than VR is going to get outside of gaming, real estate and perhaps specialized entertainment. But even there you have the same problems as Google Glass had (emphasis on past tense). You have to wear unfashionable and still somewhat clunky eyewear, so I think until something more unobtrusive such as projecting images directly into the eye or use of dual contact lens / displays becomes practical, I don't foresee people walking around on the street wearing these 24/7. There's still going to have to be a good reason to put the things on. To the point of the OP, VR in my view doesn't have compelling use cases yet. It's early days, and expecting someone to strap a breadbox to their face, be tethered to a high-end PC and stagger around their living room interacting with virtual aliens, doesn't suggest to me anything like wide adoption. So better / slimmer form factor and tetherless / wireless are priorities for gen 2. The use cases expand every week. But yep, we've got probably 60K Vives and between 30K and 150K Rifts (it's really hard to tell) out there, PSVR will probably sell through about 500K to 1M by end of year, etc. so nobody's expecting wide adoption during gen 1. Apple will at some point "invent" VR and people will jump on board (they are said to have a 500+ person team working on hardware). VR entertainment may well be TOO realistic and immersive for constant use by many. I use VR quite a bit but constant? Nobody thinks it'll be for constant use for many years (Ready Player One). It can be quite convincing though -- I've had some remarkable experiences of presence in room scale VR. Some people have vertigo issues with 3D TV and I can imagine similar issues with VR if there's any kind of processing or network delay at all. Judder / jitter is no fun (I know from the DK2 days), which is why I'm glad I haven't experienced a single second of it in my Vive with my 980Ti. Sim sickness is a complex topic, but I can tell you very few people will experience anything of the kind in a good setup on the Vive with room-scale or room-scale + teleport software. I think it's also telling that FB and Google are running their own high-capacity network cable between Virginia and Spain in an attempt to get ahead of demand. That has little to do with VR. Any sort of participative VR such as livestreaming events will require far more bandwidth (and far more bi-directional equivalent speeds) than are now typical -- just to enable the limited VR we have now. I attended a live event the other night -- Reggie Watts in Altspace VR. It was quite laggy for the first half, and got nice and smooth later on and was frankly amazing. Total bandwidth really isn't very important. Bandwidth needs for VR aren't really any greater than for other fast online multiplayer games, which aren't generally that high. Far more crucial for both is low latency, high network priority, and direct routes / fewest hops. But these needs are similar in VR as in fast online multiplayer games. If you're talking about stuff like 3D 360 video (live or pre-recorded), then sure, you need big bandwidth to deliver side-by-side 4K or higher video. But I don't really consider that VR. Microsoft's HoloLens is a little better ... an un-tethered augmented reality rather than virtual reality environment. HoloLens is currently rather crap. Magic Leap (which has far more funding) is probably a little better. There are two more high profile AR ventures. But AR is years away. Years. We probably need Lightfield technology to be viable and we definitely need FOVs above 40 degrees like Hololens currently is. Also, Hololens is currently NOT tetherless, but by the time it's a production device, VR and AR will likely be tetherless (there are several promising wireless solutions for VR up to 8K and 120Hz with latency measured in microseconds). AR and VR will both have their uses. If you are walking around the real world and want a constant stream of information about what you're seeing and the ability to keep track of other things without having to look down at a watch or phone, AR will be great. In fact, I foresee true 3D AR (not the strictly 2D HUD that the Google Glass prototypes -- and the upcoming Google Glass production version -- used) becoming as indispensable as smartphones are today, perhaps by 2030 or 2035. I predict people will eventually feel "naked" without the outboard brain and information of AR (whatever the form factor). If you want to visit someplace else, be immersed in another reality, block out your surroundings, etc. VR will be great. Having experienced VR, I *never* want to be without the ability to do these amazing things, and I know we're just in its infancy. AR, by definition, won't ever be able to immerse you like VR does. Then there's pass-through AR -- a VR headset with real-time photogrammetry, wide-angle stereo pass-through cameras, etc. AMD is actually working on one of these right now. I think this third category is pretty damned exciting myself. I dream of being able to walk around inside a Van Gogh. Right now it's nowhere near real-time. But let's go on a computational imagination experiment and combine this technique with completely wireless VR and real-time photogrammetry using wide-angle pass-through AR cameras (and add in all the other goodies like hand/finger tracking, eye tracking, body tracking, 8K resolution, 200 degree FOV, 240 Hz refresh rate, sublime comfort and form factor, etc.). This kind of power is a ways away, but imagine being able to experience a Van Gogh or a Giger made up of your actual surroundings in real-time. So better / slimmer form factor and tetherless / wireless are priorities for gen 2. The use cases expand every week. But yep, we've got probably 60K Vives and between 30K and 150K Rifts (it's really hard to tell) out there, PSVR will probably sell through about 500K to 1M by end of year, etc. so nobody's expecting wide adoption during gen 1. Apple will at some point "invent" VR and people will jump on board (they are said to have a 500+ person team working on hardware). I use VR quite a bit but constant? Nobody thinks it'll be for constant use for many years (Ready Player One). It can be quite convincing though -- I've had some remarkable experiences of presence in room scale VR. Judder / jitter is no fun (I know from the DK2 days), which is why I'm glad I haven't experienced a single second of it in my Vive with my 980Ti. Sim sickness is a complex topic, but I can tell you very few people will experience anything of the kind in a good setup on the Vive with room-scale or room-scale + teleport software.That has little to do with VR.I attended a live event the other night -- Reggie Watts in Altspace VR. It was quite laggy for the first half, and got nice and smooth later on and was frankly amazing. If you're talking about stuff like 3D 360 video (live or pre-recorded), then sure, you need big bandwidth to deliver side-by-side 4K or higher video. But I don't really consider that VR.HoloLens is currently rather crap. Magic Leap (which has far more funding) is probably a little better. There are two more high profile AR ventures. But AR is years away. Years. We probably need Lightfield technology to be viable and we definitely need FOVs above 40 degrees like Hololens currently is. Also, Hololens is currently NOT tetherless, but by the time it's a production device, VR and AR will likely be tetherless (there are several promising wireless solutions for VR up to 8K and 120Hz with latency measured in microseconds). Dude(I am assuming you're a guy)....You are the true gaurdian of this thread(I am the OP). I made this post and forgot about it completely. Thank you for being so passionate. Have you tried the PS-VR? My mind was blown....I think this, and not Oculus or vive will bring VR to the masses. It already has a built in fanbase(playstation fans) and its really...really cheap. My god!!! I played Robinson The Journey and cried. I can't emphasise this enough. World is going to the crappers too much hatred and politics. I won't mind living in my own Universe geared to the VR 4 hours a day. I imagine coming from work, socializing and what not, and then VR!!! Dude(I am assuming you're a guy)....You are the true gaurdian of this thread(I am the OP). Oh hey there. Yep, guy. Have you tried the PS-VR? Have not had the privilege yet, but I pre-ordered when it opened. I'm looking forward to it! My mind was blown....I think this, and not Oculus or vive will bring VR to the masses. It already has a built in fanbase (playstation fans) and it's really...really cheap. It has a lot of great design choices -- the RGB screen, excellent / easy form factor and comfort, reprojection creates 120Hz out of 60Hz rendering, etc. I think it hits the sweet spot as far as price, software, installed base, capability and performance, etc. It won't do quite as much as the Vive, but it will be quite a bit better than GearVR and the new Google DayDream sets. I won't mind living in my own Universe geared to the VR 4 hours a day. I imagine coming from work, socializing and what not, and then VR!!! Buying the PSVR in OCT! Nice. That was kind of the premise of the book Ready Player One -- reality = not so good, virtual reality = really good, so most people made the sane and reasonable decision to devote most of their time and resources to VR. I don't see it as necessarily a bad thing at all. It's another chapter in the evolution of civilization and communication. I got my VR system, Vive, and love it. Cant wait for games like Star Trek and Sim City to come out. I mean in Sim City now I get to walk around the city I design. How cool will that be? My system how I have it set up. 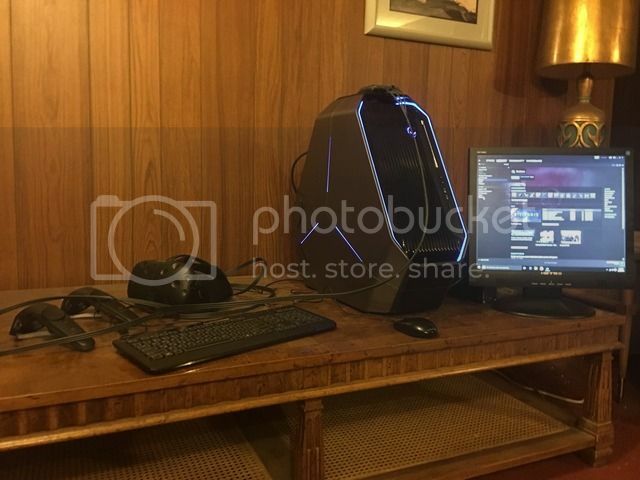 I bought Alienware and wow what a powerful computer. I got my VR system, Vive, and love it. Nice. Stop by https://www.reddit.com/r/Vive/new/ when you get a chance, there's a wealth of information there from us old-timers.